I have booked my place for the British Society of Dowsers annual conference in Leicester, from 15 - 17 September. Some really interesting speakers & workshops on offer, including Faye Palmer, whom I knew when I lived in Coventry. The cost includes single room accommodation & all meals. I'm looking forward to it. 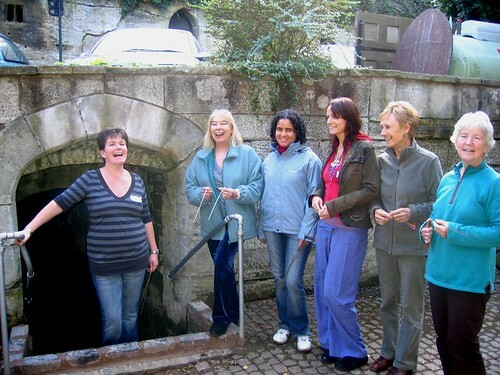 Faye Palmer & myself + others on a quest in 2007....10 years ago!! She is now the Office and Training Manger of the BSD. Unfortunately we are away on that week end. I hope you have a lovely time there. She's still referred to as Fay Palmer on the BSD website. I expect that's because most people know her by that name. Perhaps if you have cancelled your holiday, you might be able to go now? Hmm, yes, but they might just be full. I know the College of Sound Healing conference is full because Gill couldn't get in. Didn't enjoy it. Came home early. Disappointing. Also have a severe chest cold. Oh dear, Helen, I am sorry on both counts. At least you tried the conference. I hope your chest cold gets better quickly.